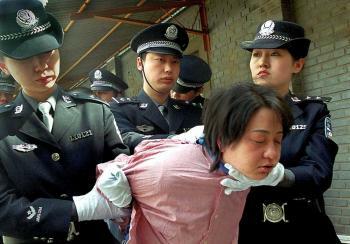 Amnesty International challenged China on March 29 to disclose the number of executions they carry out. The human rights group released its annual Death Sentences and Executions report, where they claim that the Chinese authorities executed “thousands” of people in 2009, more than the rest of the world combined. The report, based on the group’s own research, reveals that at least 714 people in 18 countries were executed last year, with the highest numbers in Iran, Iraq, Saudi Arabia, and United States. The number doesn’t include the executions in China, where statistics on death penalties remains a state secret. Amnesty decided not to publish its minimum estimates for Chinese executions, but the report from 2008 says that at least 1,718 people were executed there, more than 70 percent of the total executions worldwide. Amnesty International is a strong opponent of the death penalty, regarding it “cruel and degrading, and an affront to human dignity.” Execution methods last year included hanging, shooting, beheading, stoning, electrocution, and lethal injection. The report says capital punishment was widely used for political reasons or to silence opponents of a regime, often after “grossly unfair trials.” In Iran, 112 executions were carried out in the eight-week period during the opposition protests following the presidential elections. The human rights group, which has been campaigning against judicial killings for years, hailed efforts in Burundi and Togo, which joined another 93 countries where the death penalty is already no longer in use. In 2009, no executions were performed in Europe, where Belarus remains the only country to still sanction capital punishment. Two men were reportedly executed there this month, however. In the Americas, the United States was the only nation to carry out executions in 2009, when 52 people were executed.